Which challenges does the project HoCare target? Aging of the population is challenge for all EU regions. But it means in the same time also an opportunity for Growth and Jobs as there is created great potential to deliver innovative solution for Home Care. Common challenge in all HoCare regions is unlocked potential to delivery innovation it this field. 8 partners coming from different EU regions decided to join forces and form HoCare project to address these challenges. Objective of HoCare project is thus to boost delivery of Home Care innovative solutions in regional innovation chains by strengthening of cooperation of actors in regional innovation system using Quadruplehelix approach and the aim is to do it by improvement of relevant Structural Funds thanks to the international policy learning. These improvements are planned to be at strategical level (by governance improvement) as well as practical ones (by support of high quality projects). Which objectives has the project HoCare? 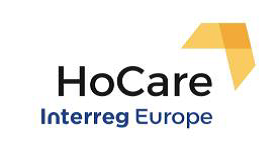 The overall objective of HoCare project is to BOOST GENERATION OF INNOVATIVE HOME CARE SOLUTIONS in regional innovation chains by STRENGTHENING OF COOPERATION of actors in regional innovation ecosystems using QuadrupleHelix approach. Project aim is to improve policy instruments in all cases Structural Funds tackling above mentioned objective at two levels. Strategic policy level will focus on the improvement of Structural Funds at national/regional level (management as well as strategic focus) to boost the generation and adoption of innovative products using of quadruple helix cooperation model, while practical policy level will focus on the generation of innovative project in the framework of Structural funds. HoCare has additionally three thematic sub-objectives related to the natural generation of innovation for Home Care in regional innovation chains. The first sub-objective is to focus on generation of innovation through ADDRESSING UNMET NEEDS identified by 4th stakeholder group in quadruplehelix model means by formal carers (i.e. hospitals, social houses, elderly houses) and informal carers (i.e. family members). The second sub-objective is to FOCUS ON GENERATION OF INNOVATION through public driven innovation processes. The third sub-objective is to BRING INNOVATIVE Home Care SOLUTIONS QUICKER TO THE MARKET by using, again, QuadrupleHelix approach. Which partners cooperate on HoCare project?